August is a great month. We finish our summer projects and vacations, decide on fall projects and get ready for a new school year. I remember getting ready for school and the clean-slate feel of it. I’ve been out of school for a long time, but the new beginning feeling remains. Reinforcing that back-to-school feeling are recent JOE articles by EDEN delegates. Chuck Schwab’s article describes a pilot evaluation of an internet educational module. The evaluated module is one portion of Chuck’s Tractor and Machinery Virtual Classroom. 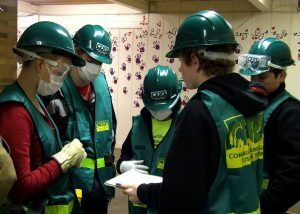 The classroom, intended for 4-h’ers, focuses on safety. There are four interactive modules: IconMatch (featured in the article; one goal is to familiarize tractor and machinery operators with universal symbols), Tractor Explorer (demonstrates physical locations of operational controls and describes their basic functions), Give Me Five (demonstrates hand signals), and Lights ‘n Stuff (not operational at this time). Hitch & Go Safely is also available (match vehicle with wagon). Fun ways to learn! In Washington, teaching the youth about the relationship between biosecurity measures and disease transmission risks falls to volunteer leaders, but what do they know about biosecurity–and where do they get their information? Susan Kerr and colleagues at Washington State University collected materials through an Internet search to learn that information on biosecurity in 4-H livestock projects is available from many sources, including Extension, but none of them specifically target volunteer leaders who oversee livestock projects. The authors also gathered information from faculty, staff and volunteer leaders to determine the need for educational materials. In response, an online module (not yet available) about biosecurity was developed for the volunteer leader audience. Learn more about this assessment that can be adapted across the country. What kind of development support does your institution provide for new employees? Expectations for new faculty are outlined in Roadmap for Excellence in Extension. Kris Saunders and co-author Diane Reese describe the process Utah State Extension uses to assist new Extension faculty through the tenure and promotion system. If you supervise employees in the tenure track or you are in a tenure track position, you’ll find this article to be quite informative. What articles have recently piqued your interest? Rick Atterberry and Steve Cain are at the first “Implementing Youth Emergency Preparedness Into Your Organization” conference. They report that it is going well and may be repeated in the future in the other FEMA regions. They promise to blog some ideas and how to find out when and where the future conferences will be held. For today they note that FEMA is developing a “Catalog of Youth Disaster Preparedness Education Resources.” EDEN is mentioned, but we need more EDEN resources in that catalog. If you have a resource send it to Rick, Steve or Abby Lillpop and they will compile the list, work with Lynette Black (EDEN youth PAWG leader) and then get this to FEMA. They need Title, Age Range, URL to find out more, and a short paragraph describing the resource. Is your resource cataloged in the EDEN database? The 4-H Youth Development program reaches youth through several avenues. Focused areas of disaster management can be included in the education youth are receiving during each experience. Following are some ideas. The Camping program is a popular way for youth to participate in a 4-H experience. Focus lessons on first-aid, safety, living without electricity, recognizing weather and impending signs of disasters and surviving disasters. Focus counselor training on the camp’s emergency plans and stress management. Club work: focus on project areas (i.e. food and food preservation focus on emergency food supply and water safety, clothing and textiles focus on appropriate emergency clothing, outdoor education focus on camping and survival skills, small animals projects focus on backyard homesteading techniques and animal health care and diseases, livestock focus on animal health care and diseases). For all project areas cover steps to stay safe during a disaster. County fair: educate on animal disease issues and human disease issues as well as evacuation planning and plan of action in case of disaster. Afterschool programs: Focus on science (i.e. what causes earthquakes, tornadoes, hurricanes), geology (volcanoes, landslides), weather (extreme heat, cold, thunderstorms), and staying safe during a disaster. Babysitting training: Focus on first-aid, family emergency plans and stress management. There are many ways to incorporate disaster preparedness in 4-H programming. For more information please contact Lynette Black, 4-H Youth Development Faculty, Oregon State University.